20a, HANDPASSHAND [Transfer, as in a bucket brigade]. Pass (from?) hand to hand. No idea what a “bucket brigade” is, but from context clues I’ll guess it’s a group of people who for some reason or another (putting out a fire?) need to pass a bucket down a line of people. 33a, EARSMILEEAR [Grin broadly]. Smile (from?) ear to ear. 50a, FACEMEETFACE [Rendezvous]. Meet face to face. Fine. Didn’t make me EARSMILEEAR, but it’s a fine theme, executed fairly consistently. A couple of fun longer answers in OUTDOORSY and C’EST LA VIE!, and some other cool entries (young adult fiction enthusiasts probably liked PEETA and AZKABAN, and I was happy to see Juliette BINOCHE), but otherwise it was a very Wednesday-ish puzzle to run on a Thursday. The only thing that tripped me up is that at 4d, I saw the clue was asking for the author of a quote, and so with just G???H? I dropped in GOETHE rather than reading the quote [Who said “The best way to find yourself is to lose yourself in the service of others], which much more obviously suggests Mahatma GANDHI. 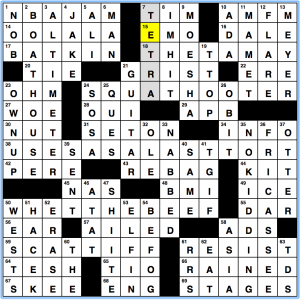 Didn’t care for the 1d clue for SIGH [Heaved “ho”?]. Heaving a sigh is fine, but I’m not sure I’ve ever heard anyone say, much less sigh, “ho” (unless they’re portraying a depressed ST NICK). Plenty of clues in this one that were either bare-bones or “?”ed to try to amp up the difficulty to a proper Thursday level, but I wasn’t on the same wavelength. Overall, I thought this was just okay. 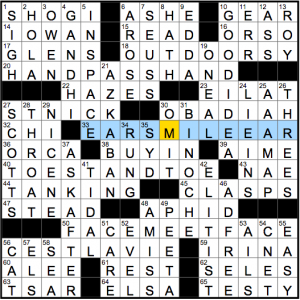 I wish it had run earlier in the week, which isn’t the puzzle’s fault, but even then I still would’ve wanted a little more bite from the clues and surrounding fill. This time I needed the revealer to figure out what was going on, and once I got it, I didn’t like it much. Our theme answers are not tricky, but they all seem to be one letter too short for the allotted space. Hmm. When I put in the crossings, I noticed something odd. 3d [Event revolutionized at the 1968 Summer Olympics] should be the HIGH JUMP. That was the year the Fosbury Flop came to international attention. I started to fill it in and stopped because there were too many spaces. What I ended up with was HIGH JUMDI. Huh? 10d [Popular Christmas tart] should have been MINCE PIE, or so I thought. I filled in MINCED PIE and wondered if I’d been spelling it wrong all my life, and then realized the P didn’t work with the crossing, so the answer had to be MINCEDIIE. Huh? 32d [Setting of the 1999 World Puzzle Championship] is BUDAPEST, which turns into BUDADIEST, so clearly P is replaced by DI. That helped me translate the central grid-spanner, but I still didn’t understand what was going on. 7d [What might get a crowd going?] is DIEDIDIERSDIRAY. Replace all the DIs with Ps and you get PEPPER SPRAY. I thought it was going to be PEP RALLY. I wish it had been. The title didn’t help – what does all this have to with soup? 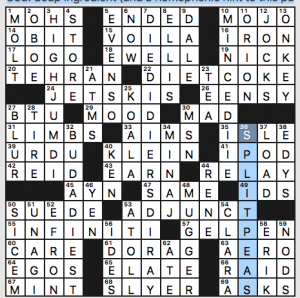 Finally, I looked at 36d [Soup ingredient (and a homophonic hint to this puzzle’s theme)] which is SPLIT PEAS. Ah. D and I combine to make P. Sort of. I guess. My reaction to this revelation was “meh,” and having unpleasant PEPPER SPRAY in such a prominent place in the grid (perhaps the seed entry) didn’t help. 1a is [German mineralogist Friedrich]. This was a gimme for me, thanks to my 35 years of being a geologist’s better half. It’s MOHS. Please note that this means his eponymous measure is not Moh’s scale, but the Mohs scale. 10a [Magnetic quality[ is MOJO, a word I always like to see because I just like it. I usually think of it as having mojo – being on a roll or a hot streak – but when Jim Morrison said he was Mr. Mojo risin’, he did have a certain magnetic quality. 40a [ ___ bottle (closed surface with only one side)] is a KLEIN bottle, a non-orientable surface related to the Möbius strip. 50a [Kid stuff] is SUEDE – kid as in goat, not child. 61a [Headwear that prevents “helmet hair”] is a DORAG. Props to the NYT for cluing this without reference to skin color. Seriously. This is a good thing. What I didn’t know before I did this puzzle: that Tom EWELL was in “The Seven-Year Itch.” This movie featured Marilyn Monroe in her iconic pose over the subway grate. Ewell played Richard Sherman, who was itching for Marilyn. I leave you with the Fosbury Flop. Do not try this at home. Theme: Made-up phrases feature four of the same letter in a row. 17a [Totally fleece bluesman King?] ROB B.B. BLIND. I had already gotten all four Bs from the crosses before I sussed out the answer. When I did, I was pleasantly surprised and even chuckled at this one. 25a [Reason to cancel a Peruvian pack train?] ILL LLAMAS. That works. 39a [“Yippee, that delicious Chinese brew!”?] “WOO-HOO, OOLONG TEA!” Fun entry. Reminds me of my puzzle from a couple years ago with the theme answer OH, DARJEELING. 49a [Why some people visit an aquarium?] TO SEE EELS. Not as fun as the others. With E being such a common letter, I’d bet there is a funner possibility out there. How about [Pooh pal as a baby?] for WEE EEYORE? 63a [One telling you how to go?] AAA ADVISOR. Another less fun one, but the clue is good. Honestly though, isn’t this a real thing? The rest are made-up with an attempt at silliness; this one, not so much. It also would have been elegant if the letters in question spelled out something pertinent. As it is, we have BLOEA. Still and all, I wasn’t expecting much from this theme, but I ended up liking it, so that’s a win. 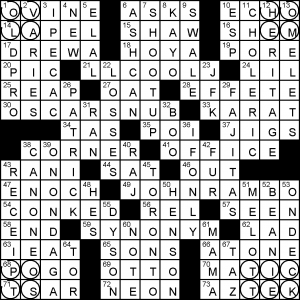 Good fill: OVEN MITTS (with the nice clue [Panhandlers?]) and MOONSHINE. Iffy fill: ILO [Agcy. that won the 1969 Nobel Peace Prize] and its crosser A TON OF. Fill that is new to me: AVAYA [Big name in Internet telephony tech]. Is it really that big? How many of us put SKYPE in there first? 14a [Lee who managed the Cubs and Phillies]. ELIA. Since when did director Kazan get replaced? 24d [Precipitate]. RASH. Dummy me, my first answer was RAIN. But it turns out that I don’t even know this definition of the word. I only know it in its verb form where it means “to cause to happen unexpectedly or prematurely.” As an adjective, it means hasty or hurried. 32d [Killer of Paris]. ROMEO. Call me a bad English major, but I never read Romeo and Juliet, so I didn’t know there was a character named Paris in the play. (And thanks for the spoiler, by the way!) This brings to four the number of fictional characters known (to me) with that name. 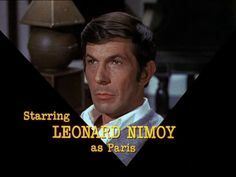 In addition, there is Paris of Troy, of course; most recently, we have Tom Paris from Star Trek: Voyager played by Robert Duncan McNeill; and lastly, we have Paris (actually, The Great Paris, he’s a magician) from the old Mission: Impossible series played by none other than Leonard Nimoy, one of my fave characters from that classic show. It was always cool to see him without pointy ears and in various disguises. CORNER/OFFICE is a colourful revealer. Apart from that, it’s a pretty basic theme – four answers can precede office: OVAL, HOME, POST, and, asymmetrically, TICKET. This design trope always results in “big”, stressed corners and a lot more space for non-theme fill in the centre. Those areas feature LLCOOLJ, as well as OSCARSNUB and JOHNRAMBO radiating into the corners. Those corners feature two awkward plurals: IEAT (clued not as the song, but as a quirky Shakespeare partial), and DREWA, plus pseudo-suffix MATIC. It took me forever to figure out that for the theme answers, RES IS T, and they’re all phrases/names/etc. where RES has, as suggested, been replaced with T — THERESA MAY, SQUARE SHOOTER, USES AS A LAST RESORT, and SCARE STIFF. Again, it’s perfectly fine, but didn’t quite do anything for me this week. Aside from this, I found a looooooot of the cluing frustratingly obtuse or obscure this week. Pinterest president TIM Kendall isn’t really on my radar, EMO fits “Moody teen, maybe” but that clue seems awkwardly phrased, BATKIN is Not A Thing, and that’s just in the first few rows of the puzzle. Things I did like seeing: SKEE-ball, BOATHOUSE, NO KIDDING, FRICASSEE, and the HACEK getting its due. Okay theme, frustrating cluing and fill. This entry was posted in Daily Puzzles and tagged Alan Arbesfeld, Andrew Linzer, Brendan Emmett Quigley, Peter A. Collins, Ruth Bloomfield Margolin. Bookmark the permalink. Re NYT-I enjoyed the theme but got hung up for a long time on 23A/24D–I still think that DIEIN is a much more plausible response than LIEIN and I confess that my knowledge of Israeli place names isn’t good enough to distinguish between EILAT and EIDAT. Die-in??????? Are you serious? We weren’t *that* zealous. I liked the puzzle very much. Is anyone familiar with Ms. Margolin? NYT: I guessed right on that cross – sheer luck – but I agree with EB that DIE-IN is definitely a real type of protest. In fact, I’ve seen several on the news lately re: the upcoming the health care bill. Some folks held up cardboard tombstones. Apologies, folks: I forgot to change the date on the ratings widget when I first made this post, so if you rated any puzzle between 10:20 and 10:30 Eastern, you should submit your rating again. Thanks! NYT: 45a [Joins hands] CLASPS, 20aT HANDPASSHAND. Bracelet or necklace clasps would have worked well here. 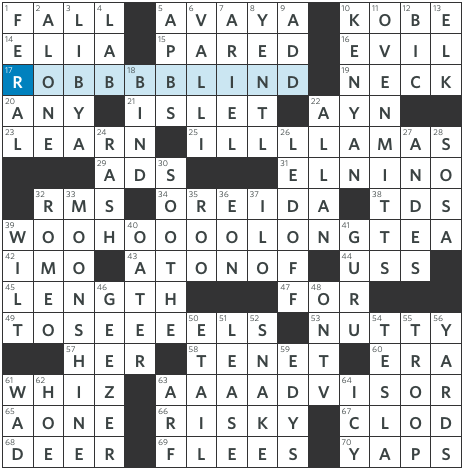 I generally like what I call Wacky Wordy puzzles and the NYT was no exception. WSJ was very clever. I thought it interesting that each of the theme answers was crossed by a down with a repeated letter. Three times [ALLAN, ROO & GEEZER] it was the same letter as the four-peat and twice [VALLI & TROOP] not, so I doubt it means anything, but I might have titled the puzzle “Two by Four” just for the heck of it. Oof. The SW of BEQ absolutely wrecked me. TESH crossing HACEK and THE (clued in French! ), and two tricky themers was rough. The rest was pretty nice – NBAJAM over OOLALA my personal favorite spot. 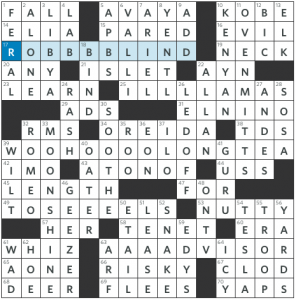 NYT was fine but I cringed at the clue for HAZES. I wish it had been clued with respect to fog or mist, something like that. Re BEQ: Also, No one mentioned 50A is also a themer. WHETTHEBEEF/WHERES THE BEEF.